This alphabet is seen in the Master Illusion Texts in the College of Winterhold. 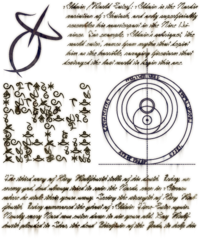 It has connections to the Mages Guild, and some of the symbols in it resemble others used by the guild. There are only five known texts using this alphabet, and as of yet there is no known translation for any of them. However, as the symbols are given in font-form, rather than images, we can see which letter each character represents by using the Creation Kit. The name "Magic Script" is only seen in the Creation Kit, as no name for the alphabet is given within the games. * The letters Q and X and the numbers are not seen in any of the books, but they can be seen by editing the books in the Creation Kit. There are no symbols for the other digits. Some of the symbols also resemble others used by the Mages guild. The letter 'K' ( ) resembles the symbol used to represent the school of Destruction, as seen on skill books and spell tomes. The letter 'E' ( ) resembles the symbol for the Mysticism skill seen in Oblivion. The passage is actually Portuguese: "Alduin é a variação Nórdica de Akatosh e só superficialmente parece-se com o seu colega nos", meaning "Alduin is the Nordic variation of Akatosh, and superficially resembles his counterpart in the [Nine Divines]", the same as the first somewhat-legible English paragraph on the same page and a sentence from Varieties of faith in the Empire. In this string, we find Skyrim and Septimus (presumably referencing Septimus Signus) and then vive em which is again Portuguese, for live(s) in.... Potentially, this could be rendered as: Septimus lives in Skyrim (ignoring the three seemingly obsolete letters QE and U and also ignoring normal Portuguese word order, which is normally subject-verb-object). The letters around the spiral are (from center outwards): WVUTS. This seems to be meaningless, simply being in reverse alphabetical order. The text beneath is illegible and in a different script. Rendered in plain text as: Alduin's civilization was the Dragon Cult of Atmora. He's basically the Dragon God on Earth. The Dragon High Priests are his acolytes and everything is ordered. The large glyph in the top left is an "H". This page was last modified on 26 March 2018, at 12:28.